My pair of the Zealot in size 10 weighs in at just over 9 oz per shoe, and stack heights reported by Running Warehouse are 22mm heel, 18mm forefoot (in a blog preview RW reports stack as 28mm heel, 24mm forefoot – I suspect that the 4mm thick insole explains the difference). With my calipers I measure stack at around 29mm, 25mm with the insole included, though it was a bit of a challenge to get a good forefoot measurement with the upper constructed the way it is. I have to start this review off by saying that the Zealot is a fantastic looking shoe, and the Viziglo orange colorway that Saucony sent me is bright. Very bright! I wore the Zealots to the hardware store a few weeks ago and the woman at the register commented that she liked my shoes. She said that bright shoes make her happy. I feel much the same way. Big thumbs up for the Zealot in the aesthetics category! 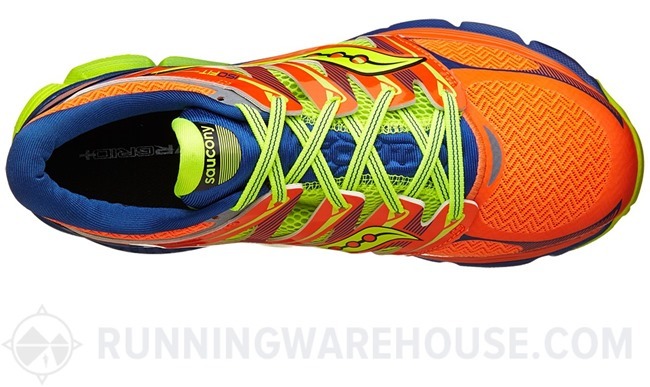 The Zealot is one of three Saucony shoes featuring a new upper construction called ISOFIT (along with the Triumph and Hurricane). 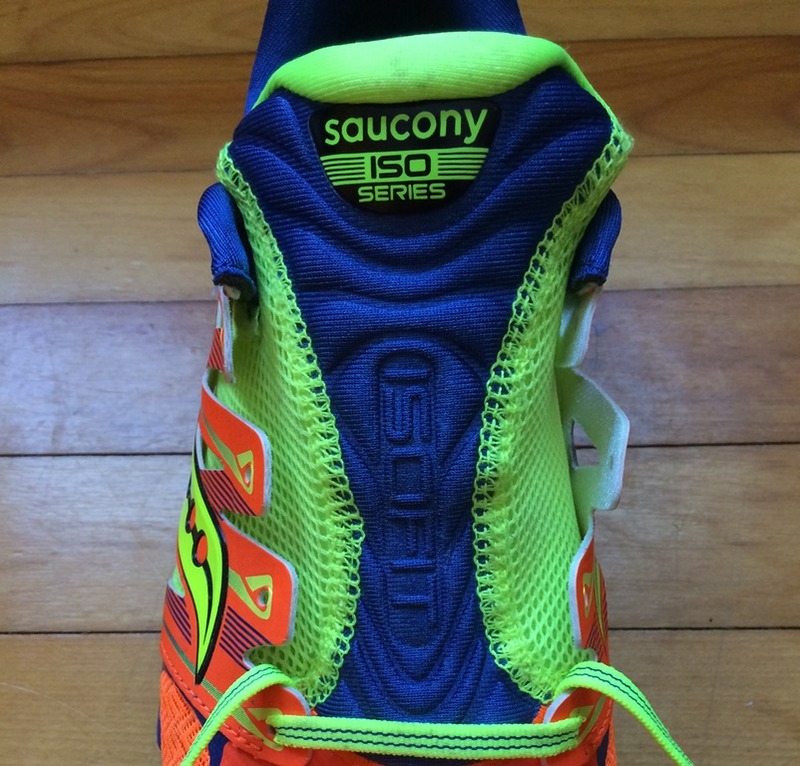 I’d heard a lot of positive things about the ISOFIT upper on the Saucony Triumph (released last year), and was excited to check it out. ISOFIT is basically a bootie-type upper that wraps the foot from midfoot forward. It’s kind of like a sock, and the laces do not attach to the bootie. Instead, finger-like projections extend upward on either side of the bootie to form the lace rows (see photos below). It’s a unique approach, and though I can’t say it feels much different from a more traditional lacing system, it seems to work well and does not cause any problems for me. The tongue of the Zealot is integrated with the ISOFIT bootie via stitching on either side – it has enough padding to prevent pressure from the laces above. The upper over the forefoot of the Zealot is a soft mesh that has a bit of give – it does not feel like a material that would be prone to tearing at the forefoot flex regions. The ankle collar is well-padded and lined by a soft fabric, and the heel is stiffened by a heel counter that Saucony calls the “Support Frame.” Overall, the upper feels very high quality. As I mentioned in the opening paragraph, other reviewers have reported that the Zealot has a fairly wide toebox. This was one of the first things I noticed upon trying the shoe on – the fit was incredible on my foot. I have a medium width foot, but fairly high volume from top to bottom, and the Zealot is pretty much perfect for me. Nice lockdown in the heel and midfoot, and a wide, open toebox. It’s not quite Altra-wide, but compared to other Saucony shoes it feels very roomy (maybe just a tad roomier than the Kinvara 5). People with narrow feet need to be careful however as my friends Thomas and Harold have both had issues with the upper bunching up at the bottom of the lace row when attempting to cinch the upper down on their narrowish feet. 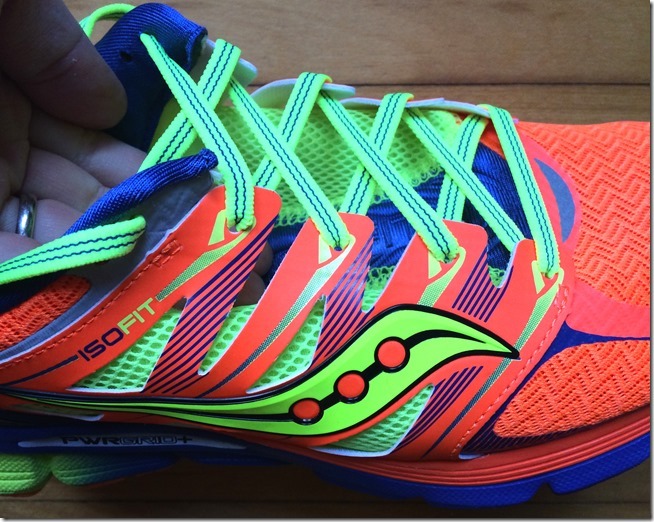 What really struck me about the fit of the Zealot was how different it was from the Saucony Breakthru, which I reviewed a few weeks ago. That shoe was pretty snug up front, so those with narrower feet might want to give the Breakthru a try if the new Saucony releases intrigue you. So far the Zealot is scoring big points with me – looks great, fit is perfect, upper is nicely done. The sole is where things slip a bit. One of the things I’ve heard frequently from others who have tried the Zealot is that though it has plenty of cushion, it’s on the firmer side. For me, it’s just a tad too firm. I’d compare the ride to the Saucony Mirage, perhaps just a bit softer, but definitely firmer than the Kinvara. In fairness to Saucony, most of my outdoor miles have been in sub-freezing temperatures, and this can cause EVA foam to firm up. However, I’ve also run several times on the treadmill in them and they are a firmer than average shoe. The combo of firm sole plus treadmill cushion has worked well so I prefer them for that purpose rather than running outside in the cold. The plus side of a firm sole is that it tends to feel better when picking up the pace, and this is the case with the Zealot for me. My buddy Sam made the same observation – the Zealot is a bit on the harsh side for slow miles on the road, but feels better as you speed up. However, if you like a firm shoe like the Saucony Mirage, the Zealot would be a good one to try. (As an aside, I ran for the first time in the Skechers GoRun Ride 4 yesterday – the fit is remarkably similar to the Zealot, but the ride was a lot softer and a better match for me for easy miles). In terms of the outsole, there is plenty of rubber on the Zealot and I expect durability should be quite good. I view this as a necessity for a shoe at the $130 price point (something Skechers may run into trouble with for the GoMeb Strada). The X-T900 rubber on the heel is a bit firmer and should be more abrasion resistant than the iBR+ blown rubber that extends from the midfoot forward. The Saucony Zealot is a great looking shoe that pairs a firm ride with a generous fit in the forefoot. The ISOFIT upper is really nice, and works well on my medium-width foot – those with narrow feet should look elsewhere. At $130 MSRP the shoe is pricy, but I expect durability should be good given the ample amount of outsole rubber present. If your budget allows, you have a medium-to-wide foot, and you like a firmish ride, the Zealot is worth a try. The Saucony ISOFIT Zealot is available now at Running Warehouse . For other takes on the Saucony Zealot, see reviews by Harold Shaw, Sam Winebaum, Thomas Neuberger/Meaghan Murray, and Brandon Wood. If you think the Zealot is a little too firm, you should try the Triumph … more cush with the same ISO fit. Have heard a lot of good things about the Triumph, might have to give it a try. Am I seeing things, or is there some rubber on the medial side? Every other picture of the Zealot I’ve seen inexplicably has nearly 2/3 of the medial side covered in exposed EVA. Yes, except for the gap under the arch. Pete, how was the arch on this compared to a Kinvara 4 or 5? I had a pair of Kinvara 4’s and although my flat feet took no notice of the high arch height the sole’s wear pattern looked like my mild supination was amplified. In the end the Kinvara 4’s didn’t last me as long as I felt they should’ve because of the outside edge wear. I’d say comparable, but the Zealot is a firmer shoe overall so may not give as much. 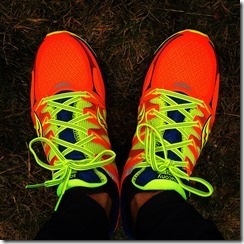 Pete, do you have confirmation that Saucony is killing the Virrata, as you have suggested previously on this blog? I would need to know, in order to stock up on those shoes while they’re still available, perfect shoes for me: light, simple, cushioned, comfortable, let’s you run the way you’re meant to run! Haven’t heard direct from Saucony, but enough second-hand from those in the retail world that I think it’s gone. That really is a shame. I think there might be a problem with the marketing around this shoe, as a “minimalist” “zero-drop” shoe, something for radicals, extremists and so on, while actually it is quite easy-running, comfortable shoe that could appeal to a wide array of runners. I’ve since bought a pair of Kinvaras also, and prefer the Virrata, as less rubber on the sole makes it more flexible and softer. Right now saucony.com has Virrata for $58.00. Great review!!! Pete how’s the upper on GR4 in terms of width? I’m kinda hesitant now on pulling the trigger on the Zealot because of the wide toe box. Are you asking how the Zealot compares to GR4? Been running in the ISO Triumph for a month, and the Zealot for a matter of days. I really like both. Triumph is borderline too much shoe for me, but it’s great for slower runs/recovery runs. The Zealot compares favorably to the Kinvara but my guess is that it will be WAY more durable thanks to the rubber on the sole (versus the Kinvara’s exposed EVA). No complaints at all thus far. Excited to try to new Fastwitch. I’m not sure if you’ll see this as this is an older review, but as a very lightweight runner (140lbs), do you think this is too much shoe for someone like me? I struggle with this dilemma often, as I’m pretty efficient and run in shoes like HyperSpeed and Flyknit 4’s, but for long long distance with Spring coming up, I think I need something with some more cush – just not too much cush. I’m stuck between Kinvaras and Zealot’s, or something else altogether. Help? 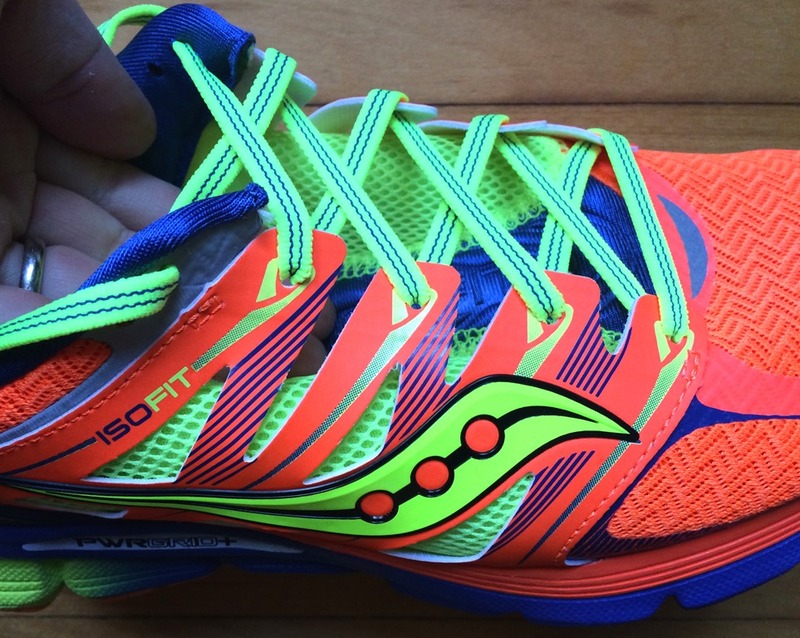 The Zealot is a fairly firm shoe, Kinvara would be a bit more cushy. Peresonally, I’d take the Kinvara given a choice between the two and sounds like we have similar shoe tastes. Oops, yeah I confused my Zealot vs. Triumph in terms of cush. Anyway, thanks for the input – I’ve been turned off by Kinvaras since the 2 but I guess need to go try them on again! I liked Kinvara 3, hated K4, like K5. Ordered the K5 from RW, really really hoping to love them since way back when, the K1 is what took me from huge stability to Mirage to Kinvara, and IT band injury free ever since (7 years I think). Any chance you’ve worn the new Launch 2? I didn’t like the New Balance 1400, heel got in the way for me since I’m so used to 4-6mm and under. The Hyperspeed’s are fantastic and I don’t notice the heel at all. I may buy the Launch 2 to try, just wasn’t sure if you’d run in it yet. Thanks again! Yes, have run a few times in the Launch 2. MY guess is if you didn’t like the 1400 then you will like the Launch 2 even less. It’s pretty much a lightweight traditional neutral trainer, quite a bit of heel. I like it, but if 4-6mm is your preferred drop then the Launch will feel like a lot more shoe than you prefer. 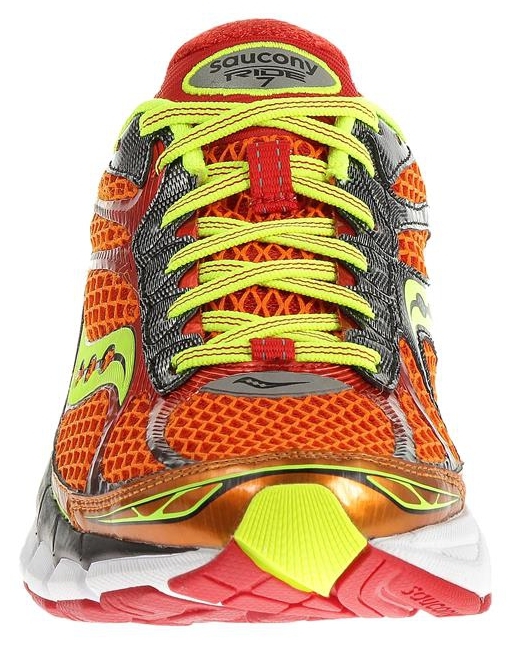 Currently I’m running in Mizuno wave inspire 10 and would like to switch to Saocny, do you think is a smart move to switch to zealot? The Zealot will have a lower heel and it may take a bit of time for your calves to adapt to that. 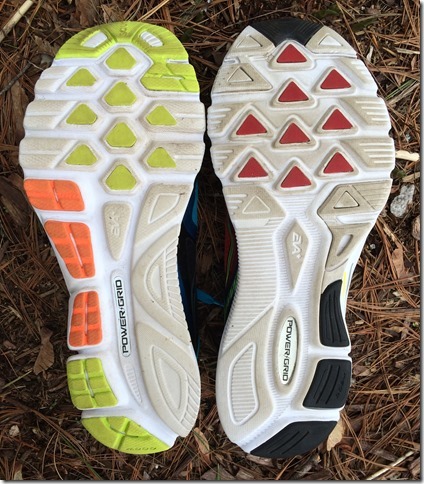 The closer match from Saucony would be the Hurricane or Guide. 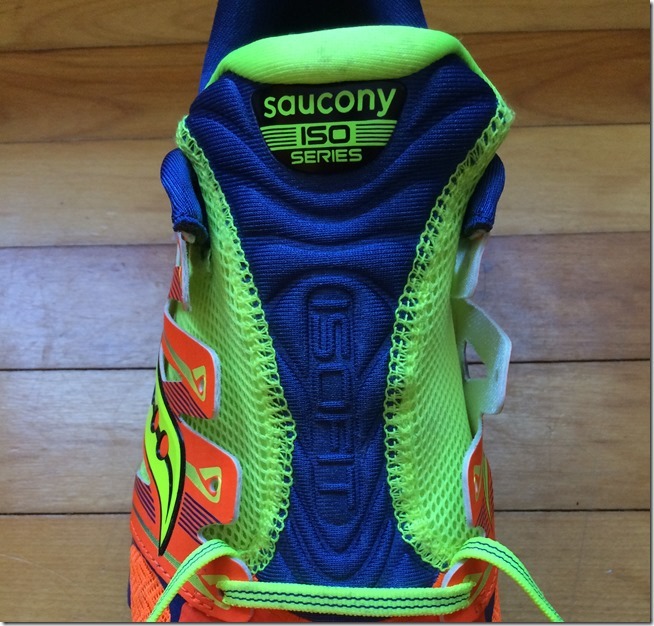 How’s the cushioning/firmness of Zealot compared to the A6? Totally different shoes so really hard to compare. A6 has a thin sole so feels firm, Zealot a much thicker sole but also firm. I prefer thin and firm to thick and firm. I’m surprised you found these to be firm. Maybe because you tested them outside in winter so much? Or maybe your media samples were not a final production run? I find the Zealots to be quite a bit softer than Kinvara 5s, though, yes, the sole is less flexible, as one would expect with increased stack height. Really nice ride, though. The genius of this shoe is the upper, however. It fits so well that you just stop thinking about fit and the conversation about the Zealots is then almost always about the cushion and/or relative stiffness. The fit is that good. The ISO Fit thingy reminds me of some of my Salomons, especially Sense and S-Lab X-Series. Seems very similar, actually. Could have been the cold, might need to pull them out on a warmer day and see how they feel now that it is hitting 80 regularly. I wouldn’t say they were firm. But they definitely aren’t as soft in my opinion than Kinvaras.